Feb. 28, 2013 5:00 a.m.
MLA Verlyn Olson has joined the anti-bullying campaign. 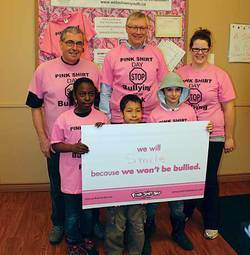 He and Mayor Bill Elliot donned symbolic pink shirts and joined representatives of the Wetaskiwin Boys and Girls Club on February 21st to express their support for the anti-bullying campaign. The Pink Shirt Committee believes that by encouraging wearing of symbolic pink shirts and pink rubber wrist bands the anti-bullying message will spread. Historically, pink has always been a symbol of femininity. So much so that in-the-past people felt it was unacceptable for a ‘real man’ to wear pink. Local businesses, schools and other organizations in Wetaskiwin are rallying behind the campaign. Some of the new participants are the Wetaskiwin Hospital kitchen, housekeeping and lab staff, WDACS, BMO, Brokerlink and the Family Medical Clinic. Centennial and Norwood announced they will be wearing pink and the Winfield School will be awash in pink as every student has been provided with a pink shirt. On February 27th , watch for these and all the other participants such as the Town of Millet, City of Wetaskiwin, Wetaskiwin Credit Union, CIBC and all the other schools, banks and businesses that will be decked out in pink t-shirts.